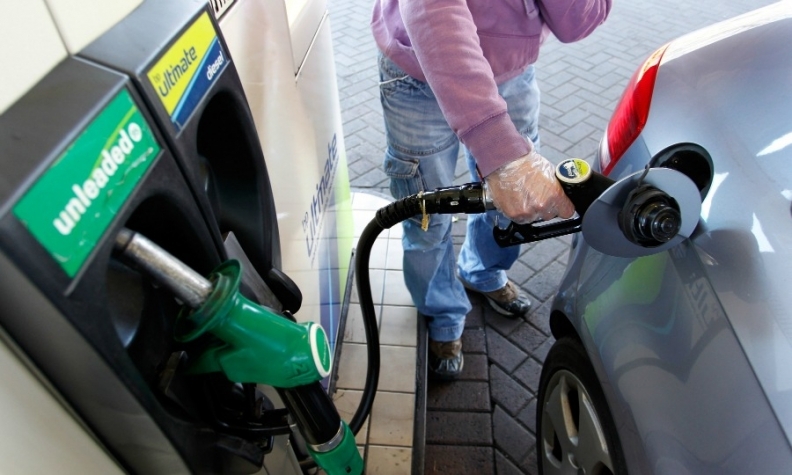 A motorist fills his car with diesel at a fuel station in the UK. Air pollutants from diesel emissions have been linked to respiratory problems. LONDON (Bloomberg) -- London has a dirty secret. Levels of the harmful air pollutant nitrogen dioxide at a city center monitoring station are the highest in Europe. Concentrations are greater even than in Beijing, where some have dubbed the city's smog the "airpocalypse." European Union efforts to fight climate change have traditionally favored diesel fuel for vehicles over gasoline because it emits less carbon dioxide, or CO2. However, diesel's contaminants including nitrogen dioxide have swamped benefits from measures to reduce car emissions in the city that include a toll drivers pay to enter central London, a thriving bike-hire program and growing public-transport network. "Successive governments knew more than 10 years ago that diesel was producing all these harmful pollutants, but they myopically plowed on with their CO2 agenda," said Simon Birkett, founder of Clean Air in London, a nonprofit group. "It's been a catastrophe for air pollution, and that's not too strong a word. It's a public-health catastrophe." Tiny particles called PM2.5s probably killed 3,389 people in London in 2010, the government agency Public Health England said in April. Like nitrogen dioxide, or NO2, they come from diesel combustion. Because the pollutants are found together, it's hard to identify deaths attributable only to NO2, said Jeremy Langrish, a clinical lecturer in cardiology at the University of Edinburgh. "Exposure to air pollution is associated with increases in deaths from cardiovascular disease such as heart attacks and strokes," Langrish said. "It's associated with respiratory problems like asthma." The World Health Organization says NO2 can inflame the airways and worsen bronchitis in children. London isn't alone in having bad air in Europe, where 301 sites breached the EU's NO2 limits in 2012, including seven in the British capital. Paris, Rome, Athens, Madrid, Brussels and Berlin also had places that exceeded the ceiling. The second- and third-worst sites among 1,513 monitoring stations were both in Stuttgart after London's Marylebone Road. "Nitrogen dioxide is a problem that you get in all big cities with a lot of traffic," said Alberto Gonzalez Ortiz, project manager for air quality at the European Environment Agency, which is based in Copenhagen. "In many cases it's gotten worse because of the new fleets of diesel cars." The EU limits NO2 to a maximum of 40 micrograms per cubic meter of air. The concentration on Marylebone Road, a stone's throw from Regent's Park, was almost 94 micrograms in 2012, according to the most recent data from the EEA. The level for the site last year was 81 micrograms, and it's averaging 83 micrograms this year, according to King's College London. In 1998, when the King's College data begins, it was 92. That's about the time the switch to diesel started. In contrast, Beijing had a concentration of 56 micrograms last year, according to China's Ministry of Environmental Protection. The Chinese capital has a worse problem with other pollutants, registering almost triple the level of PM10 particles (bigger than PM2.5s) as on Marylebone Road. London's air has improved since the "pea-souper" fogs in the 1800s and 1900s. In 1952, the so-called Great Smog killed 4,000 people. East Londoners couldn't see their feet through a choking blanket of smoke caused when cold air trapped industrial emissions and coal fumes. That led to passage of a clean-air law in 1956, seven years before the U.S. Clean Air Act. Air pollution and particulates are "invisible and there isn't the same pressure on politicians" as in the 1950s, said Joan Walley, an opposition Labour Party lawmaker who leads the Parliament's cross-party Environmental Audit Committee. "It requires a long-term strategy." Walley's committee began an inquiry on May 2 to assess government efforts to improve air quality, calling for written submissions by June 5. While the government blamed an April spike in pollution on dust from the Sahara alongside domestic emissions and particles from continental Europe, the prevailing winds mean London typically exports its own problem. "It's not rocket science to figure out that we contribute mostly on westerly winds to our neighbors," said Martin Williams, professor of air quality at Kings College. Europewide policy triggered the problem. The "dieselization" of London's cars began with an agreement between car manufacturers and the EU in 1998 that aimed to lower the average CO2 emissions of new vehicles. Because of diesel's greater fuel economy, it increased in favor. The European Commission, the EU regulatory arm, "is and always has been technologically neutral," said Joe Hennon, a spokesman. "It does not favor diesel over petrol-powered cars. How to achieve CO2 reductions is up to member states." EU rules enforced since 2000 allowed diesel cars to produce more than three times the amount of oxides of nitrogen including NO2 as those using gasoline. New rules that took effect in September narrow that gap. "The challenge is much greater that we had thought just a few years ago," said Matthew Pencharz, environment and energy adviser to London Mayor Boris Johnson. "A lot of that is due to a well-meant EU policy that failed. We're stuck now with these diesel cars -- about half our cars are diesel, whereas 10, 15 years ago, it was lower than 10 percent." The UK Department of Environment, Food and Rural Affairs in 2011 estimated it would take London until 2025 to comply with the 2010 rules. The government didn't ask for an extension to comply because doing so comes with a requirement to show it was possible by 2015. For Green Party Leader Natalie Bennett, the solution is simple: Get people out of their cars. "Fifty-six percent of journeys we make in Britain are less than 5 miles," Bennett said in an interview. "If you turn a significant percentage of those into walking and cycling journeys, then you've made huge progress."